Dare to Fly!! : Money!! Is a Means. Mercenary attitude or money mindedness is the root cause of most of the evils. We all have become the worshipers of Mammon. 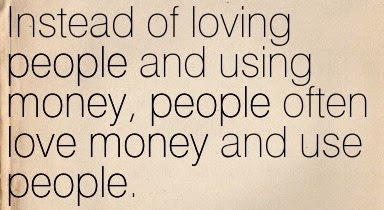 Lust for money is more intoxicating than wine or drug. It has robbed us of our health, peace and happiness. Commercialization and consumerism have created an insatiable craze for commodities. Malls are the new temples. The fast changing models of consumer items have developed a culture of “use and throw.” Spending rather than saving is the new mantra of the modern tech-savvy generation. Ostentatious display of wealth is the latest fad. This rat-race has started taking its toll. We are so engrossed in this money-spinning game that we have become oblivious of the real meaning and purpose of life. Most of the people die with this regret that they have earned a lot of money but they have not learnt the art of enjoying life. Wealth can procure comforts but it cannot procure happiness. It can purchase a cozy bed but it can purchase sound sleep. It can buy medicines but it cannot buy good health. Like the proverbial King Midas, the blessing of the golden touch has become the greatest curse for the money-makers. Physical and mental well being is far more important than being well off. “A single-minded focus on making money can make us insensitive to other smaller but perhaps more satisfying joys of life”, observed Charles Dickens. So, stop chasing the mirage and enjoy the beauty and divinity in everything that is around you. Money making is not bad. The more you earn, the more you can give. Be the trustee of your wealth in the words of Mahatma Gandhi. Riches do not enrich you. Renunciation enlightens you.